Bahrain imposed emergency rule last month after weeks of anti-government protests in the tiny Gulf kingdom, where the Sunni monarchy is accused of discrimination against the Shia majority. The authorities used force to put down the protests, which have left more than 25 people dead. Rights groups say the government has since detained more than 400 people - including human rights activists, doctors, bloggers and opposition supporters. The interior ministry said Mr Saqer was injured while resisting guards' attempts to restrain him. He later died in a hospital. Photos taken before his burial showed criss-cross purple lash marks all over his back. His legs were also badly bruised, and his toes and feet were covered in purple bruises. There was a big bruise on the left side of his head and possible burn marks on his ankles and wrists, said Daniel Williams, a senior researcher with Human Rights Watch (HRW), who viewed the body as it was being prepared for burial. "This looked much worse than anything I've seen," Mr Williams said, referring to other cases in Bahrain of apparent lash marks seen on the backs of people detained at checkpoints. Mr Saqer was arrested on 13 March for the attempted murder of a policeman, the ministry said. The government denies any torture but says all such accusations will be investigated. 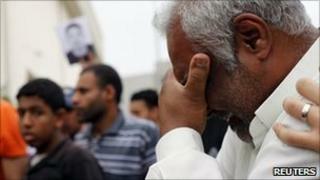 It said the other detainee, Mr Hassan, had been "found dead" in his cell. A post-mortem said he died of complications from sickle-cell anaemia. Mr Hassan was detained on 2 April on charges of "inciting hatred, publishing false news, promoting sectarianism and calling for the overthrow of the regime" on social networking sites, the interior ministry said. HRW said both the families of the men who died of sickle-cell disease, according to official records, had dismissed the findings. "It is extremely scary that in all three cases of the deaths last week, the families only heard about their loved ones when they were dead," Mr Williams told the BBC. HRW has called for an investigation into all suspected cases of abuse, and stressed that all detainees must be given access to lawyers and their families. In the two most recent cases, Bahraini activists say the men were abused physically and mentally, and may have died as a result. "We believed they killed them in prison," said Nabeel Rajab of the Bahrain Center for Human Rights. On Monday, the authorities accused Mr Rajab of publishing fabricated images on the internet and summoned him for questioning. Meanwhile, the former chief editor of Bahrain's main opposition newspaper - al-Wasat - said he too had been summoned by a prosecutor investigating the paper's allegedly unethical coverage of the uprising. The latest moves come two days after a leading opposition figure and rights activist, Abdul Hadi al-Khawaja, was beaten up and arrested in the capital, Manama. The unrest started on 14 February, when Shia protesters - emboldened by uprisings in Tunisia and Egypt - took to the streets urging democratic reform. Some called for the overthrow of the monarchy. Weeks of protests prompted the Sunni-led government to impose martial law and invite in troops from Sunni-ruled neighbours such as Saudi Arabia and the United Arab Emirates. Since then the Bahrain government - a key US ally in the region - has launched a crackdown against opposition activists, journalists and doctors. It accuses Iran of fomenting the unrest - which Tehran denies.